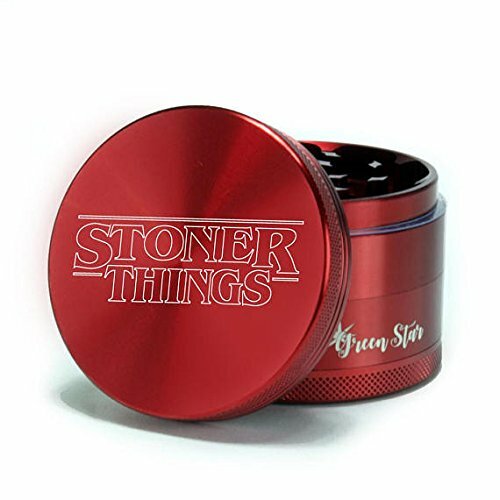 2.5" 4 - Piece Herb Grinder with laser etched Stoner Things Made from aerospace medical-grade aluminum. A high quality herb grinder at the most affordable price. Built with features, a lifetime warranty and Ships from USA - within one business day! FINE GRINDING - 28 Diamond shaped teeth that guarantee you a fine grind. With neodymium magnets to ensure a tight close. STORE AND SCRAPE YOUR POLLEN - Don't miss any bit of your tobacco or herbs. It stores automatically inside your pollen chamber. Free plastic scraper included! SCRATCH RESISTENT - Anodized looks great and prevents smudge, flakes, scratches, and fingerprints. Also comes with free microfiber bag. UNIQUE DESIGN - Our grinders have custom artwork laser etched so that means your design won't peel, scratch, or fade! A TEXTURED GRIP - Easy on your hands. If you have any questions about this product by The Stash Co, contact us by completing and submitting the form below. If you are looking for a specif part number, please include it with your message.